Hi there. I’m back to an earlier posting schedule, hoping to get at least two notes out to you this week. Last time we spoke of staging vs. decorating, and I wanted to touch on some of the differences today. Yes, there is a difference … a major one! But it’s not complicated. I like to keep things simple, and tell people to just think of staging vs. decorating as public vs. private, or leaving vs. living. In staging, you’re leaving the home, you are appealing to the public so you want others to be able to picture themselves there. When decorating, you are telling your private story, sharing your many treasures to show how you live there. As sellers, remember that you are leaving now, so pack up all the personal stuff. For a good example, I compare home staging to theater staging. In school and community theater, I’ve often helped build and prop sets for plays. On stage, limited spaces must represent several places. You have to define a room but leave it open to viewer interpretation. You also have to limit your props to allow actors to move about freely. In effect, you’re presenting an illusion, giving people a sense of something, which then allows them to imagine further. This room is wonderfully staged. Colors are VERY neutral and decorative props are basic. Bare windows and good arrangement instantly show off the $$ lakefront location and invite the viewer through the room take a closer look at the water. If decorated, walls could be more colorful, and windows would be draped. Table tops and couch would not be bare, and the mantle could display a favored art piece and more personal treasures, rather than the generic pieces featured.. In staging your home, the goal should be similar to the theater set. Give buyers the illusion of what a wonderful house it could be for them. You want your prospect to get an immediate sense of the room, but keep it basic to allow them to imagine what it could be if it were theirs. You’re leaving and you want them to come live there. All white vs. color is sometimes a debate when staging. The idea that everything should be painted white when staging, is a bygone premise these days. As a long time realtor turned stager, I’ve realized that all white is a negative more often than a positive selling feature. It presents coldly, often stripping a room of warmth and character possibilities. Those fearful of too much color are just as hesitant with none at all. A soft, neutral hue is comfortable but not frightening to most everyone. To stage this room, I would paint a very light, warm beige (taking colors from the tile in the adjoining room). This would compliment the warm, mixed wood tones and also accent the next room, creating great flow. 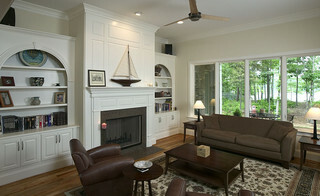 For every statement or suggestion in decor, an opposite or contradicting view can be presented. While white walls can be cold, this room is certainly not chilling. Here the walls are accompanied by warm toned accessories, lots of marvelous textures and basic but BIG decor pieces, which stage this space beautifully. Again, in decorating there would be a bit more accessories on the bed tables, and perhaps a bench with area rug at the end of the bed. I feel this would definitely be a staged room. Light, bright but not ALL white. A little tricycle prop in the adjoining room. Nice, but if there are little tykes to go along with the trike, it’s doubtful you would have white cloth dining chairs and crystal vases on the table for everyday living. And speaking of walls, that paint had better be highly scrubbable in such a light color. 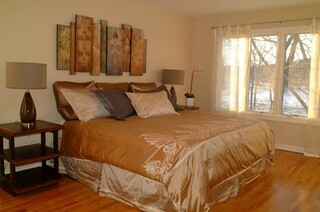 I’m torn with this shot determining staged vs. decorated. This is just a gorgeous space how ever you look at it. It is definitely nicely decorated (love it) but I think you would get plenty of “ooh ahhs” from prospective buyers as well. And when selling, you have to also give people something GOOD to remember you by … so they’ll buy! This is a wonderul example of what just a touch of wall color can do. Picture these rooms WITHOUT the gray upper walls. Even with the dark counter and floors, it would just be bland. The gray zips it up and adds a certain something … warmth … elegance. (I dislike the word “pop” in decor). Wow. This is a decorated vs. staged for me. The distinctive blues used are very personal color choices, not favorable to everyone. And I enjoy all the personal pieces on the shelves. Mine would certainly be filled this way to live, but perhaps not to sell. 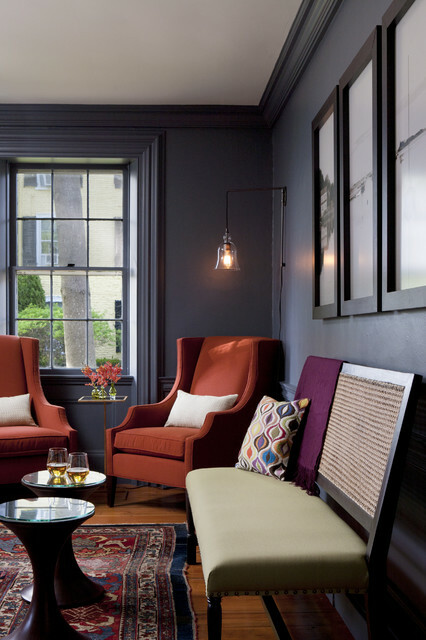 While many believe that dark colors should never be used in small rooms, I feel they can be very effective, and shouldn’t be dismissed when decorating. I applaud the bravado of color choices in this as a personal space, but for staging … not so much. Great living room though, but I like LOTS of color. Your buyers may not. Whether you’re selling or staying in your home, it’s good to clean out the clutter and less stuff is usually better than more. In staging “pieces” should be effective while kept to a minimum. But likewise in your personal decorating, don’t display every single thing you own all at once. 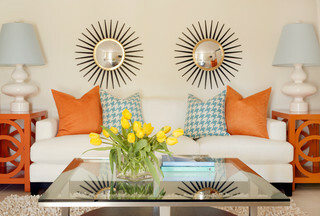 By changing out items and displays, you give yourself several new looks over time without being over board at any time. Above all, have fun and … don’t stress, just start. Thanks for stopping by. You’ve just read “What’s the Difference …Staging vs. Decorating” featured on Artzzle.com. You’re invited to ask a question or leave a comment. I look forward to your input.